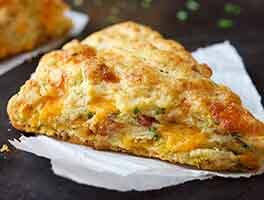 Here's a basic scone recipe just waiting for you to add your own personal touches. With a cup of whole wheat flour (which, trust us, you'll never notice), they add a touch of fiber to your breakfast, along with great flavor. 13 mins. to 15 mins. 23 mins. to 30 mins. Preheat your oven to 500°F. Lightly grease a baking sheet, or line it with parchment. In a large mixing bowl, blend the dry ingredients together thoroughly. With a pastry blender, pastry fork, a mixer or, most easily, your fingertips, work in the butter until the mixture is unevenly crumbly. If you're adding any "extras" (see tips below), toss them in, stirring to distribute. Take about 20 seconds to stir in the liquid. The dough will be rough and shaggy but that's the way it should look. Turn it out onto a well-floured board. Flour your hands and the surface of the dough well. Knead it very gently about 10 times, just enough to bring it together. It is not supposed to be smooth and springy like bread dough. Sprinkle on more flour as you need it to keep the dough from sticking. Cut the dough in half, and press or roll each piece gently with a well floured rolling pin into a circle about 6" x 1/2". You can tidy up the edges with the palms of your hands if you want, but do it gently. Half the charm of scones is their "shagginess." Cut each circle into 6 wedge-shaped pieces with the edge of a bench or bowl scraper (or spatula), pressing down firmly without sawing. You'll find it easier if you dip your cutter in flour after each cut. Make sure you press it into the dough quickly, without twisting or sawing. This shears the dough cleanly rather than pressing it together, which allows the scones to rise higher. Transfer each piece gently to the prepared baking sheet, leaving a half inch or so between them. Put them in the oven, reduce the temperature to 450°F, and bake for about 13 to 15 minutes, until they're a light golden brown. Remove the scones from the oven, and serve hot, warm, or at room temperature. Wrap any leftovers airtight, and store several days at room temperature; freeze for longer storage. 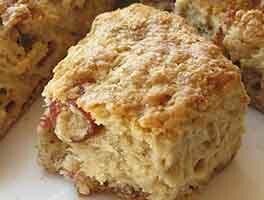 The name "scone" probably comes from the Gaelic word "sgonn" (which rhymes with gone), meaning a shapeless mass. And the early scone probably was. Because wheat doesn't grow well in Scotland, scones were originally made of oat or barley flour — both of which, lacking gluten, made dough that was probably just plopped onto a hot griddle without shaping. What's the difference between a biscuit and a scone? It seems in this country, in most cases, that when a baking powder biscuit is either plain or savory, it remains a biscuit; and when it's sweetened with sugar and fruit (or chocolate, or cinnamon, or...), it becomes a scone. 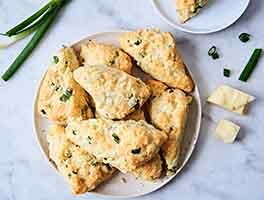 Whatever you decide to call them, biscuits or scones are unbelievably easy to make; they bake in minutes, and, if we slow our lives down enough to enjoy them with a leisurely breakfast, a savory supper, or with a cup of tea in the afternoon, we'll have adopted a tradition worth keeping. Fruit: A traditional British scone contains an added cup of currants or raisins. An American counterpart might be 1 cup of blueberries, fresh or frozen; cranberries, fresh or dried; chopped apple, or peaches. Spices: To use alone or to vary the flavor of a fruit scone, add up to a tablespoon of spice (cinnamon, ginger, nutmeg, allspice, cloves or a combination) to the dry ingredients. Nuts and/or seeds: A cup of halved or chopped pecans, walnuts, hazelnuts, or almonds, either alone or with fruit, add great flavor and texture. So will sunflower or pumpkin seeds or pine nuts or pistachios. Add these as you would the fruit. Lemon or orange zest: Add a teaspoon of grated lemon or orange peel to your dry ingredients. If you want the flavor of lemon or orange but not the grated knuckles, use our orange oil or lemon oil. Cheese: A cup of grated sharp cheese, such as Cheddar or Parmesan, is a great addition. A teaspoon of dry mustard blended with the dry ingredients, or prepared mustard beaten into the liquid, adds to and intensifies the flavor. Use just 1 teaspoon sugar for this version (or any other savory scone). Herbs: Two teaspoons of dried or a tablespoon of fresh herbs, alone or in combination with cheese, makes a wonderful variation. Savory combinations: Add 1/2 to 1 cup chopped ham, hard sausage, or crumbled bacon to your dry ingredients as you would fruit or nuts. Chocolate or other chips: Add 1 to 1 1/2 cups chocolate chips (or other flavored chips), and 1 teaspoon vanilla. Delicious and so easy! I picked this recipe because I happened to have buttermilk on hand (but no eggs, and only 6 tbsp of butter). I made it with the max recommended sugar. I added a cup of frozen blueberries. They turned out wonderful and much less sweet then the commercial ones. Yum. These scones turned out perfect. I made a half recipe and the ratios were right. I put in the maximum butter and sugar. My add in was dried cranberries that had been rehydrated with rum. I put a glaze on them (powdered sugar with a tiny bit of milk and mixed). My family loved them. I was afraid I had overkneaded the dough because it was smooth and a little stretchy, but it was perfect. They rose just the right amount and spread only slightly. The only variation I made was to use only white flour instead of half and half. Buttermilk was the perfect activator. Well these are yummy! I made them exactly to the recipe today, using 4 T. sugar and 5 (or 6?) T. butter. Brushed the tops with half and half and sprinkles on a little raw sugar for crunch. I baked them to 13 minutes, tested one, and put them back to bake for two more minutes. My fellas, when served with these and a pot of homemade strawberry jam, did not hesitate to dive right in. The ensuing silence at the table (and dwindling pile of scones) told me everything I needed to know. I do think I can cut back some of the sugar next time, they weren't overly sweet but it's something to think on. I am more hesitant to cut back the butter, even though I probably should. But dangit, it surely makes them delicious! This is a perfect baseline recipe to play with. I look forward to using it often. Lovely scones--tender and perfect with a cuppa. Used 4 T. butter and 2 T. sugar along with dried cranberries and white chocolate chips. I love being able to use less fat and sugar, and they turn out perfectly. This was a disaster. There must be some mistake regarding the quantity of buttermilk. The "dough" was way too wet--more like pancake batter than scone dough. Are you sure it isn't 1/2 cup of liquid? Wonderful recipe. I wanted to use up buttermilk and this recipe was perfect. I used the KAF ceramic scone pan which made 8 scones. Added Truvia instead of sugar, crystallized and ground ginger and some lemon peel. Delicious! Will make these again. Maybe blueberry and ginger next time. Great classic scone! We tried 4 TBSP of butter, 4 TBSP of sugar, and 3 cups of heavy whipping cream to get the right consistency of the dough. Simply delicious! The recipe worked pretty well. I ended up with a more biscuit like product. Which is fine because I love biscuits. They have a nice texture and flavor but it wasn't really a "scone". I used only 1 T of sugar, and 6 T butter. I think the recipe would have been more effective if I had shredded in some frozen butter instead of cubed refrigerated butter. I used 1/2 c lowfat plain yogurt, and 1/2 c whole milk. I may have overworked the dough while bringing it together. It was incredibly crumbly so it was hard to bring together without overworking. Hopefully that will improve with practice. I am hoping to have more success with more sugar and less butter, less working, and buttermilk. Will that do the trick? I made these (sort of) this morning. I didn't have any white flour in the house, so used what I had = 2 cups of WW and 1 cup of WW Pastry flours. Cut the sugar to 4 tsp. Added 4 TBS of chia seeds. Used 1 1/3 coconut milk instead of milk and butter. Used 2 TBS ground flax and 6 TBS hot water to sub for eggs. Added lemon zest and about a TBS of fresh lemon juice, and 2 tsp of vanilla. Made a glaze of organic powered sugar, coconut milk lemon juice and vanilla. And I am uber lazy, so I just dropped them in clumps onto a baking sheet. I just inhaled 3 of them. This is a super easy and delicious recipe. I hate when I order a scone and it's more cakey than crunchy. These were perfectly textured and delicious. Maybe not proper English scones, but proper awesome scones! Vegan can be yummy. I have used your scone mixes and love them. I would like to know why you sell a scone pan and never in recipes or box mixes have times for baking in a scone pan. I bought one of your scone pans and seems I didn't need to!